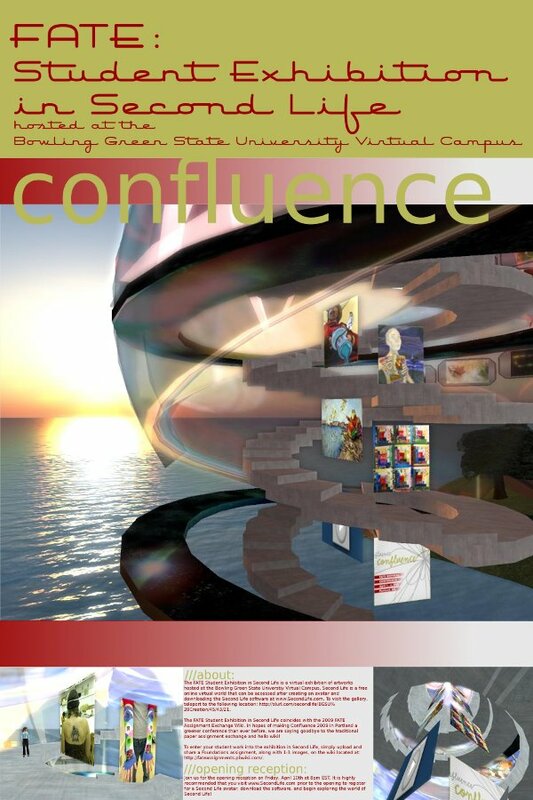 The Bowling Green State University Virtual Campus in Second Life highlighted on YouTube. The BGSU Second Life Staff is proud to announce the commencement of a series of blog posts that will highlight the work of different members of the BGSU Second Life Learning Community. On this occasion, the spotlight is on Dr. Montana Miller, who was featured in a Zoom News article about her work in Internet research ethics. In addition to being a member of the Learning Community, Pedagogy and Scholarship in Second Life, Dr. Miller has also served on BGSU’s Human Subjects Review Board since 2006, and is chair of the Internet Culture area of the Popular Culture Association. 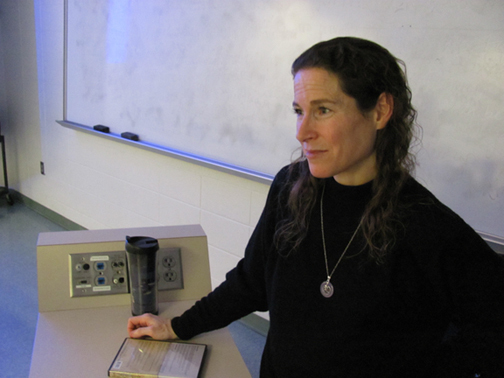 Miller’s expertise lies in the emerging field of Internet research ethics, in which she herself is making great strides in promoting a better understanding of the context and ethical dilemmas such research entails. Internet research is growing among social scientists, which in turn creates an area of concern for institutional review boards (IRBs) at universities and funding agencies. The Advancing Ethical Research Conference where Dr. Miller spoke is the annual meeting of the PRIM&R (Public Responsibility in Medicine and Research) organization, who, after Miller’s dedicated attendance for several years, have invited her to become a member of their faculty. She has also received other invitations to speak and present her research, such as her upcoming appearance at the AERA (American Educational Research Association) conference for their Online Teaching and Learning division, where she will be the keynote speaker. Dr. Miller’s investigation of Second Life and other virtual worlds informs her research on Internet ethics. 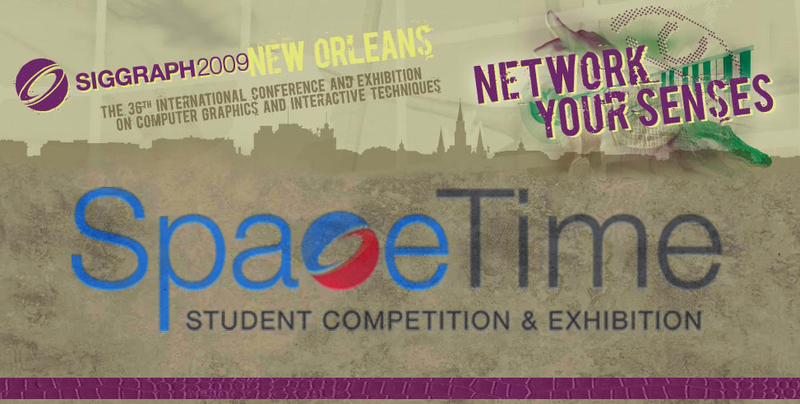 The SpaceTime competition is an international juried exhibition for students currently enrolled in school and studying computer graphics and digital arts disciplines. The exhibition captures the state of creative computer-based student work and acts as an annual slice of the computer graphics continuum. The exhibition encompasses three general areas: Print, Animation, and Interactive works. 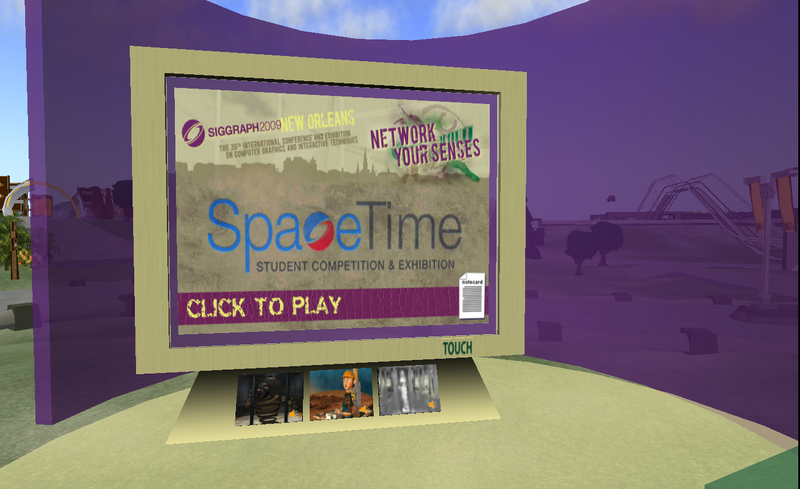 This year’s SpaceTime exhibition is hosted in Second Life on the BGSU Virtual Campus. The exhibition is now open and features over 80 artworks. Our dynamic media player in Second Life allow visitors to watch all the animations on demand. SIGGRAPH (short for Special Interest Group on GRAPHics and Interactive Techniques) is the name of the annual conference on computer graphics (CG) convened by the ACM SIGGRAPH organization. The Virtual Campus Blog can now be accessed on Facebook via the new BGSU RSS Reader application! Keep up with our headlines and details from each post on this blog! 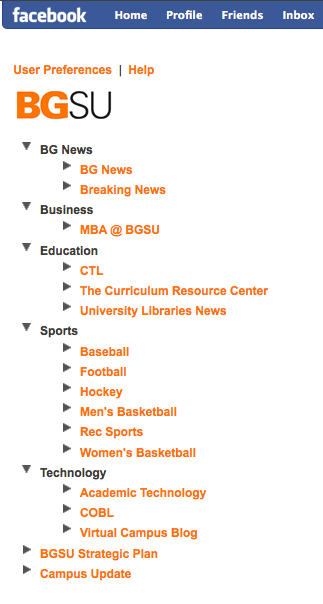 A FACEBOOK APPLICATION MAKES STAYING ON TOP OF BGSU NEWS EASIER! There is now an application available for all Facebook users to keep track of what’s going on at BGSU. This application collects information from the top blogs at blogs.bgsu.edu, The BG News, and Campus Update straight to your Facebook so that you don’t have to go hunting for the latest news. Simply add the application found at http://www.facebook.com/apps/application.php?id=41501853292 and click on the arrows to see the top headlines from The BG News, business, sports, technology, and education related feeds at BGSU. The development of the application was supported the Office of the CIO and Information Technology Services and is intended for better communication across campus. Anthony Fontana, Learning Technologies Consultant for the Office of the CIO and designer of the Facebook application views Facebook as a very versatile platform for the exchange information. Fontana sees this application as a way to aggregate the best of the BGSU campus blogs and RSS feeds onto Facebook, so that information is accessible where the students and faculty spend their time online. The application was written by ITS programmer Chris Wammes. The Office of the CIO and ITS have agreed to make the code available to other members of the BGSU and Facebook community. Community members interested in creating a similar RSS Reader for Twitter feeds or classroom blogs can use this code. ITS hopes what they’ve started can benefit other BGSU community members who would like to create their own Facebook applications. The RSS feeds currently on the application were chosen due to the quality and regularity of their content. To submit your official University campus blog please send the URL to afontan@bgsu.edu. Future improvements to the application may include the RSS feed from the University Academic Calendar. Comments Off on Read us on Facebook! Please join us on Friday, April 10th at 8pm EST on the BGSU Virtual Campus for the opening of the FATE: Foundations in Art: Theory and Educations Student Exhibition in Second Life. This exhibit features student work by FATE members, including artwork by students of BGSU faculty members: Michael Arrigo, Joe Mesier, Joel O’dorisio, and Anthony Fontana. Each artwork, when clicked, leads to the FATE assignment wiki, a wiki that enables art educators to share assignments for 2d, 3d, Drawing and other college Freshman art courses. 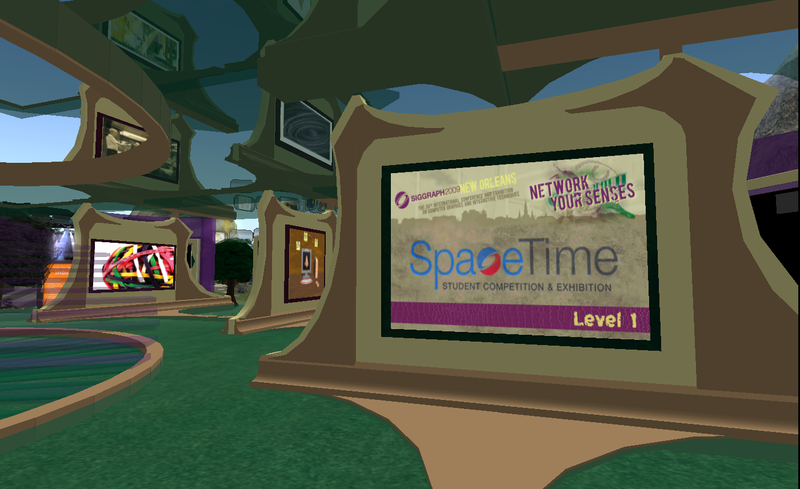 Come meet FATE members, see the artwork, and experience an gallery opening on BGSU’s Virtual Campus in Second Life!